It's a new beginning. A fresh start. For players like Adam Dunn, it's a chance for redemption after a disappointing season. For players like Alex Gordon, it's a chance to prove that you are the real deal and last year wasn't just a fluke. 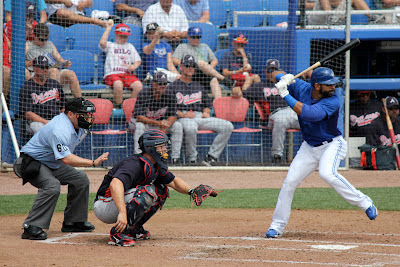 Jose Bautista was in that very position on opening day 2011. Everybody shares the home run lead. Every pitcher has a zero in the loses column. Every team is in first place. I love opening day. For Blue Jays fans this opening day, there seems to be a little bit more to be excited about. A re-vamped bull pen. A new second basemen and a new centre fielder since last opening day. A young Canadian phenom playing third. A catcher back for his sophomore year after breaking the franchise record for home runs by hit by a catcher while in his rookie campaign last season. A young team who think that they can win right now. Even though it took them a little extra time, on Thursday in Cleveland that's exactly what they did. The Blue Jays and Indians played 16 innings on opening day at Progressive Field to kick off the 2012 season. I'm sure everyone knows the story by now so I won't recap the whole game, just a few highlights that caught my attention. Ricky Romero did not look like himself and was having trouble controlling the ball. He did seem to settle down a little after the home run that put Cleveland on top 4-1. Justin Masterson pitched very well for Cleveland and attacked the lower half of the strike zone. He was also very effective in throwing breaking pitches low and outside that had some Toronto hitters chasing. Through eight innings he allowed only 2 hits and one run. That run coming from a home run off the bat of the reigning home run champ. The other hit was a double from Adam Lind. Colby Rasmus was great in centre field which was very good to see. I have not been shy about how I felt about the Rasmus deal when it was completed and after the end of the year last season. Some of my concerns with Rasmus was that when he got here he didn't seem to want to hustle. His sense of indifference to the game he played and some comments he made were also unsettling. I said earlier this year that I would be happy to deal him back to St. Louis for Rzepczynski straight up and this was my stance until two weeks ago when I saw him at spring training. He wasn't hitting, but he was hustling. He played centre field very well and his only hit in the two spring games we saw was an infield hit to short that he ran out and beat the throw at first base. That is something we never would have seen out of him last year. After Thursday's game of solid defense and a fantastic diving backhand catch. He has almost made a believer out of me. Toronto's Bullpen was brilliant. I have said many times that I love the bullpen Toronto has this year and we got our first look on opening day. Romero exited after five and the seven bullpen pitchers combined for eleven innings of shut out baseball. I would be comfortable with a relief staff that included Frasor and Janssen as the seventh and eight inning guys. The fact that the Jays have these arms available to them at the front end of the pen is fantastic. I know it is only one game, but I really believe that this is the type of performance we can expect out of this bullpen moving forward. In the ninth, Edwin Encarnacion hit a double that my friend and I were convinced was gone. So was Edwin. However the wind kept the ball in the park and it bounced off of the wall scoring two and tying the game. Then, seven innings of great pitching later, JP Arencibia got his home run count for 2012 started. After missing a sign and attempting to bunt, Arencibia smacked a 1-2 pitch over the left field wall to put Toronto up 7 - 4. Following a slight mix up on the part of Luis Perez, Santos came in and retired the final two Cleveland hitters to seal the victory for the Blue Jays. Game two is Saturday afternoon in Cleveland. Brandon Morrow gets the start for Toronto after a strong spring. I think Morrow is going to have a very good season. Let's hope Saturday gets it started for him. After all, we are tied for first place.